Help 10 Students go to Scotland and Perform on the World Stage! 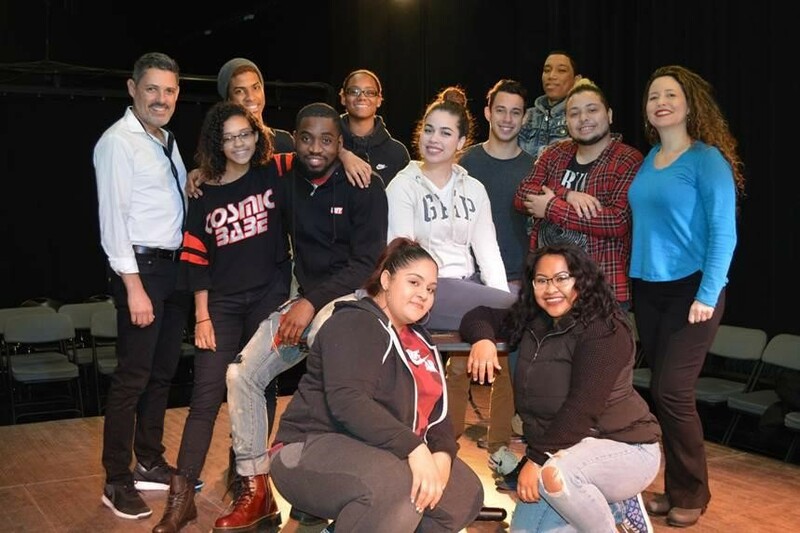 (Back row, L-R): Hostos Repertory Company Director Angel Morales, Reynaldo Martinez, Destiny Allen, Andrew Vinals, Jairo Peña, Frank Lopez and Hostos faculty and Rep Director Natasha Yannacañedo. (Middle row): Cosmic Babe shirt (Thalia Lopez), James Saunders, and woman in Gap Krystal Lopez. (Front row) Anna Rios and Thanna Son. During the summer of 2013, Hostos Community College helped 11 student-actors experience a life-changing journey to the Edinburgh Festival Fringe in Scotland. The troupe from the College’s Repertory Company, the “Hostos Rep,” was the only community college in North America invited to join approximately 24,000 other performers and artists from 41 countries at one of the largest theatrical events in the world. Now, Hostos has been invited back as 10 more students will perform on the world stage at the Festival Fringe in August of 2018. Angel Morales, Lecturer and Coordinator of Visual & Performing Arts at Hostos and the Director of the Repertory Company, has been instrumental in getting the students to Edinburgh for both trips. For him, it has also been a life-changing experience. News traveled fast about Hostos’ trip in 2013. In fact, The New York Times chronicled the student’s incredible journey, and you can read that story here. What makes this feat particularly special is that although Hostos does not have an academic theater program, the Hostos Rep has established a solid reputation as a Spanish-language and bilingual ensemble and a showcase platform for emerging playwrights from the United States and Latin America. Among the honors the company has received are several ACE (Association of Latin Entertainment Critics of New York) and HOLA (Hispanic Organization of Latin Actors) awards, as well as an invitation to showcase a full production at the Kennedy Center American College Theater Festival, Region 1, in 2010. The award-winning Hostos Repertory Company (Hostos Rep) is the resident theater troupe of the Hostos Center for the Arts & Culture. An initiative of the Hostos Community College Humanities Department, the company casts students, faculty, staff, and professional artists. The Hostos Rep is a key part of the Hostos Center for the Arts & Culture, which consists of a museum-grade art gallery, a 367-seat theater, and a 907-seat concert hall. The Hostos Center presents artists of national and international renown. It also presents emerging and established local artists, and it offers workshops in drama, folk arts, and dance to community residents.